The African violet has been a favorite flowering houseplant for many years. Its compact size and ability to produce constant blooms through out the year make this plant perfect for windowsills. With the proper care, these plants can be enjoyed for many years to come. Remove the African violet from the original growing container by gently tapping the sides and lifting the plant. The plant should be lifted at the base using extra care not to break the leaves. Inspect the roots for damage. The roots should not be brown and mushy. If they are brown and mushy this would indicate rot. Rotting is due to over-watering and poor drainage. Remove any excess soil and dead flowers and leaves. Mix the African violet mix with the perlite. The ratio should be approximately 2/3 African violet mix to 1/3 perlite. The perlite helps to aerate the soil, giving the roots plenty of room to grow. Place approximately 1/2 inch to an inch of the mix into the new container. The container should not be much larger than the original growing container. Place the plant in the container. Carefully add the potting mixture around the sides up to the bottom leaves. Gently pat down the soil. The bottom row of leaves should be just above the rim of the container. Water the plant with room temperature water. If the water is too cold, it will cause the leaves to curl downward and turn brown. It is recommended to let the water sit overnight to let some of the chlorine evaporate. Too much chlorine can cause the leaves to burn and diminished flowering. Place the plant in a sunny window. African violets need plenty of daylight and sunshine to flourish. Occasionally rotate the container as the leaves will reach for the sun. This encourages even growth and prevents the plant from being lopsided. 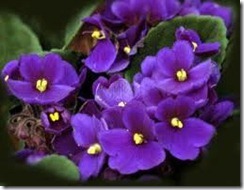 Groom the African violets at each watering by removing dead flowers and leaves. Occasionally remove 2 or 3 bottom leaves to promote new growth. 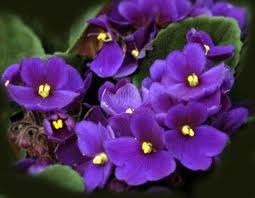 Fertilize with African violet fertilizer according to the manufacturers instructions. Be careful not to get fertilizer on the leaves and water thoroughly to prevent burning of the leaves or roots. The African violet should be re-potted occasionally using a fresh soil mixture. Over time, the soil loses nutrients and becomes stale. If using the same pot, be sure to wash the pot thoroughly to remove old soil and mineral deposits. Never water African violets with water that has been treated with water softener. The use of water softener will alter the pH and interfere with the plant’s ability to absorb nutrients.